The 2015-16 season ended for Miami on March 12, after being swept in two games at Minnesota-Duluth in the first round of the NCHC Tournament. This campaign ended a day earlier, again after a two-and-out in the conference quarterfinals and on the same ice surface. The RedHawks’ season ended with a 5-3 loss to No. 3 UMD at Amsoil Arena on Satuday, as Miami finished with its fewest wins since 1990-91. Brenden Kotyk and Nick Wolff scored early in the first and second periods, respectively, to give the Bulldogs a 2-0 lead. Anthony Louis (photo by Cathy Lachmann/BoB). But Miami (9-20-7) ran off the next three, as Justin Greenberg found the net on the power play with 8:18 left in the middle stanza and Kiefer Sherwood and Anthony Louis connected 1:48 apart early in the third period, giving the RedHawks a 3-2 advantage. That was the fourth lead of the series for Miami. Once again Minnesota-Duluth (23-6-7) came back. Jared Thomas tied it at three with 6:35 to play, Alex Iafallo put UMD ahead for good 2:12 later and Dominic Toninato sealed it with a late empty netter. Miami forward Justin Greenberg (photo by Cathy Lachmann/BoB). Louis finished his career with 126 points, as he tied John Ciotti and Dave McClintock for 20th on Miami’s all-time leaderboard. It was his first marker in 14 games. Greenberg is also a senior, registering a goal in his final collegiate game. Sherwood’s goal was his 14th of the season, tying him with Louis for the team lead. The RedHawks are now 0-8-1 in their last nine games at Amsoil Arena and are 0-4 in the postseason there. Overall they have not beaten the Bulldogs in their last 10 meetings (0-8-2), with their last victory over UMD coming on Feb. 21, 2015. This was just the fourth season in the program’s 39-year varsity history it has failed to reach the 10-win mark and the first time it has happened under coach Enrico Blasi. It’s the first time since Blasi’s inaugural season that Miami has posted consecutive losing records, which it last did in 1998-99 and 1999-2000. The RedHawks finished the season winless in their final 10 and 1-12-2 in their last 15. MU had not gone 10 games without a win since 1990-91 but did that twice this season. Miami loses three seniors – Greenberg, Louis and defenseman Colin Sullivan. The RedHawks open the 2017-18 season on Oct. 6 against Providence at Cady Arena. OXFORD, Ohio – Johnny Wingels missed the last four months of his final juniors season because of concussions. And after he’d worked his way back on the lineup card his first season at Miami 3½ years ago, the worst thing that can happen to someone coming off that type of head injury occurred: Another major concussion. For the second time in a year, the 5-feet-10 defenseman suffered through the aftereffects. He decided the risk of permanent injury was too great and opted to hang up the skates after just 11 games in a RedHawks sweater. Wingels is the younger brother of Ottawa Senators forward Tommy Wingels, and when Johnny was very young, he was dragged to Tommy’s practices each morning. Inevitably, Johnny took up the sport as well. The brothers are from Wilmette, Ill., a northern suburb of Chicago, and fortunately for Johnny Wingels, his juniors rights belonged to the Chicago Steel. He was called up from Triple-A to the Steel for two games in 2011-12 and was slated for a starting role the following season as an 18-year-old. Wingels exceled in his only season in the USHL. He recorded assists in each of his first two games of 2012-13 and racked up seven in the first 22 contests. In mid-December vs. Dubuque, he received a minor concussion and was out for nearly three weeks. But in his first game back from that injury, he was blindsided and suffered a more substantial concussion. Wingels said he had others before that, but these were his first two documented cases. That cost him the balance of the season, as he wrapped up a brief juniors career with 26 games played, seven assists and a plus-2 rating. Wingels had visited Princeton and Yale, but he had narrowed his college choices to St. Lawrence and Miami. With two sisters and his older brother having chosen the latter, Wingels went that route as well. Coming to Miami meant joining a team that his older brother had captained four seasons earlier. Tommy Wingels recorded 99 points in three years in Oxford and has logged 355 NHL games between San Jose and Ottawa, scoring 52 goals and assisting on 72 others. By the start of the 2013-14 season, Tommy Wingels was a regular for the Sharks and had set a high bar for the Wingels name in Oxford. Comparisons were inevitable when another skater named Wingels joined the team. Johnny Wingels celebrates with Justin Greenberg during an exhibition goal vs. Windsor in 2013-14 (photo by Cathy Lachmann/BoB)..
Cracking MU’s lineup presented a challenge. Wingels had not played since January, and the RedHawks had seven other highly-skilled defensemen on their roster in 2013-14. That meant Wingels was going to have to beat two of them out each night just to earn a spot in the lineup. Wingels played in three of Miami’s first six games that season but was scratched for the next eight. Finally in late November, he forced his way onto the ice with his dependable and heady stay-at-home style, dressing for six consecutive tilts and eight of nine. Johnny Wingels (21) defends his own net vs. Nebraska-Omaha (Cathy Lachmann/BoB). 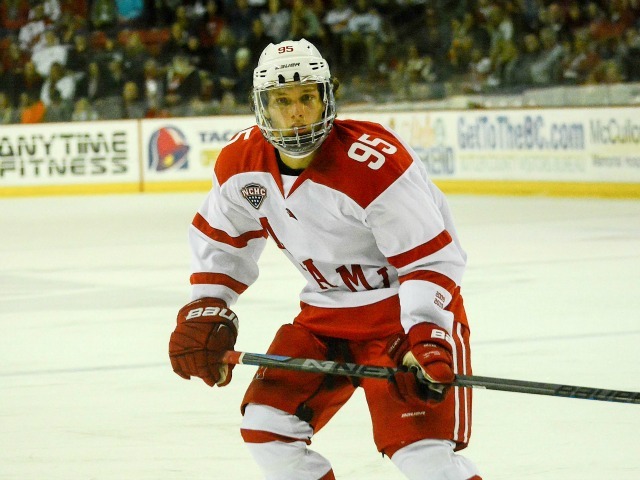 Wingels was a regular in the RedHawks’ lineup when he headed to Colorado College in late January of that freshman year. In the series opener, Wingels got the puck from the blue line along the boards, ran a scissors play and tried to cut back. But when he did, he was crushed from behind, slamming his head into the boards. No penalty was called at the time and Colorado College actually scored before the next whistle, but after reviewing the play, a major penalty was assessed to CC. So he finished the game and felt fine the rest of that Friday night. But when he woke up on Saturday, those familiar concussion traits had returned. And they didn’t go away. Wingels defends his net vs. UNO (photo by Cathy Lachmann/BoB). At that point, Wingels had to weigh his future in hockey vs. his future quality of life. And while Wingels had logged quality minutes in his brief Miami career, he was undrafted, and just six defensemen in the history of Miami hockey have ever made the NHL. During this time, he read an article about Scott Parker, an enforcer for the Colorado Avalanche who sustained at least 20 concussions. At that point, it had been five years since head injuries forced Parker out of the game, but he still suffered from seizures, acute nausea and intense ringing in his ears. Like the previous season, Wingels’ headaches and other maladies lasted over four months. The chance of long-term effects increase as concussion totals mount in an individual. Wingels (21) celebrates a goal vs. the Mavericks (photo by Cathy Lachmann/BoB). In about a year and a half window, Wingels had already suffered through the recovery process for over eight months in total. “I sort of had the mindset that if I kept playing, I had to assume that this would happen again eventually just because of the nature of the sport, and that’s not something I was prepared to handle again,” Wingels said. Fortunately for Wingels, he had already made a couple of close friends on the team in current fellow seniors Colin Sullivan and Justin Greenberg, who could empathize because of their own injury histories. Wingels finished with 11 games played, seven shots on goal and seven blocked shots. But just because he was done as a defenseman did not mean his Miami career was over. He was given an opportunity as a student-coach, a position he has held for the past three seasons. Wingels said that being a coach who is also a student – and one who has players in his class still lacing up the skates – can be a little awkward. And while Wingels is enjoying his role as a coaches’ assistant, his career goals are loftier. He has a 3.61 grade-point average as a finance major and would love to work on Wall Street. Or if he did work in hockey, his dream job would be general manager of an NHL team. Greenberg and he and Wingels initially ended up hanging out frequently because the pair were in business school. Wingels has made the transition from player to coach look easy, but his friends know how much he misses taking regular shifts on game night. Off the ice, Sullivan called Wingels one of the most genuine people he’s ever met. Obviously, being limited to 11 games was not what Wingels was hoping for when he came to Oxford in the summer of 2013. But he has still enjoyed the Miami hockey experience in addition to thriving in the classroom. And he has still found a way to contribute to the team without putting on his No. 21 jersey. Having watched a lot of hockey at a lot of levels, it’s not hyperbole to say this is one of the most frustrating teams to watch in this lifetime. Unfortunately, that cliché about “close” counting doesn’t refer to hockey and hand grenades, or else Miami would be in much better shape after its 3-3 tie at No. 2 Minnesota-Duluth on Friday. Because in many ways, close is what the RedHawks (9-16-7) are to being a successful team and not one mired seven games under .500, facing a brutal road series to advance in the NCHC Tournament in two weeks just to extend their season. And it’s frustrating that they’ve not been able to close teams out too many times this season. Close – amazingly – is what Miami is to defaulting to home-ice advantage in that round despite a 5-12-5 league record, as the team is only six points out of that elusive fourth seed. Frustrating because with Duluth and Denver running away with the top two seeds, the points threshold for that seed is lower than in any of the four seasons of the NCHC. Close in forward depth, as this team has true offensive stars in Anthony Louis, Kiefer Sherwood, Josh Melnick and Carson Meyer. Gordie Green’s stock has soared the past two months, and Willie Knierim seems to be figuring it out at a steady, big guy, 19-year-old-in-D-I pace. Frustrating because the other seven forwards on the roster have a combined total of seven goals. Close at defense, an area BoB highlighted at the beginning of the season with half of its studly blue line from 2015-16 graduating, as Grant Hutton is becoming a leader among this group and youngsters like Chaz Switzer appear to be gaining confidence. Frustrating because that progress has been too slow for some, veterans are making too many unforced mistakes and opponents are still setting up shop in front of the Miami net far too often with over 90 percent of the regular season in the books. Well past close to “arrived” status in net, as Ryan Larkin has been a savior for this team – pun intended – as he has faced far too many A-plus scoring chances this season but still owns a .912 save percentage. Even that area is frustrating because he appears to be either tiring or losing a bit of confidence and has allowed the occasional soft goal in recent weeks that never would’ve gone in during December or January. Close because this team showed a flash of excellence when it ran off five straight wins around the holidays and outscored its opponents, 18-2 in the third period and overtime during that span, with Melnick netting a pair of highlight-reel OT winners. Frustrating because the RedHawks suffered through an 0-7-3 span – their longest winless stretch in a quarter century – and are currently 1-8-2 in their last 11 during their most important games when they were given every chance to move up both in PairWise and the NCHC standings to earn their way into the NCAAs. And oh yeah, they’ve been outscored, 16-4 in the third period in their last seven, giving up multiple goals in the final stanza in every one of those contests. This weekend is a microcosm of close and frustrating. 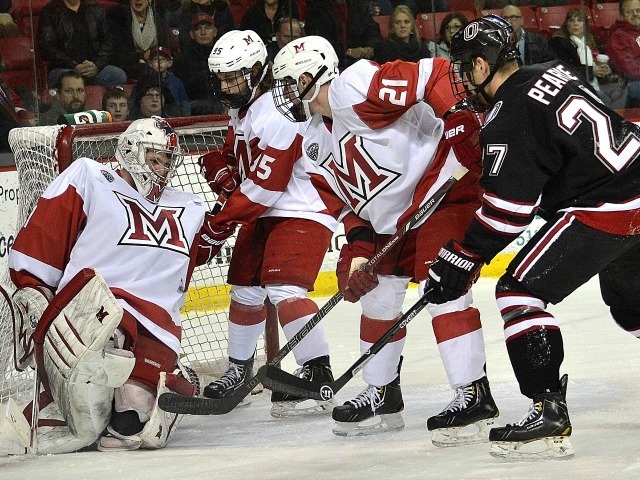 Miami came back from 2-0 on Thursday to tie the second-ranked team in college hockey on the road, then after the Bulldogs (20-5-7) surged ahead again, the RedHawks again evened the score at three. Finally UMD buried a power play chance with a minute and a half left. Miami salvaged a tie on Friday and earned the extra league point. 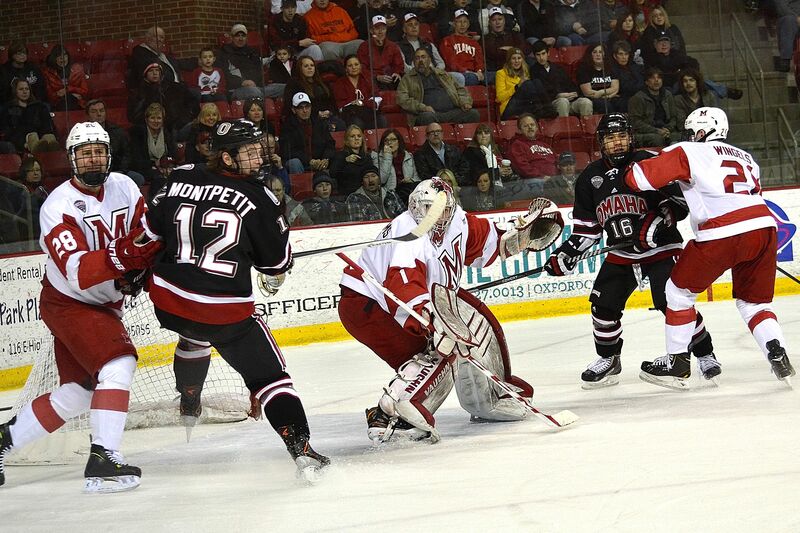 The RedHawks have played some of their best hockey against top-ranked opponents like Minnesota-Duluth. This was probably the toughest series on Miami’s entire season schedule, and even without its captain, MU hung with the Bulldogs both games. But it’s the story of the season: the RedHawks couldn’t get the win either night. Close doesn’t count in hockey. – Is this series an example, like we talked about last week, of a team that is playing loose because home ice and PairWise are no longer factors? At six games under .500 heading into this weekend, these outcomes really don’t matter except for NCHC Tournament seeding. That takes a lot of pressure off a team that was in a bad place after the recent St. Cloud series. The focus now is getting better next weekend and preparing for that all-important best-of-3 in two weeks. – How much of an impact does the return of Justin Greenberg and the loss of Louie Belpedio have on this team? Greenberg’s injury hurt the team on the penalty kill and in the faceoff circle, and Louie Belpedio missed this weekend after being kneed last weekend. Those changes can affect the chemistry of a team – positively or negatively – and based on where Miami was for the Denver series and where it was this weekend, it seems like the RedHawks got a boost from Greenberg and were more fired up after losing their captain. – And on the latter, BoB wishes a speedy return to Belpedio, who is a team leader on and off the ice and a delight to talk to. He’s had some struggles this year with penalties and turnovers, but captaincy on this team is very difficult. We even saw it affect Austin Czarnik, one of the best Miamians in team history and a current NHLer who could play there for the next decade. – In fairness to the above, injuries really have played a role with this team, as Meyer, Larkin, Belpedio, Greenberg and Jared Brandt have all missed time this season, and with just three extra skaters on the team, Miami doesn’t really have the depth to absorb personnel losses. Christian Mohs hurt his knee before the season even started and has been out for the season, which put the RedHawks shorthanded from Day 1. – Miami was mathematically eliminated from home ice after failing to secure three points on Friday. Long story as short as possible, if the RedHawks won out and Nebraska-Omaha won on Saturday then was swept next weekend, and St. Cloud State was swept, that would be best albeit super-unlikely scenario, as Miami would finish in a three-way tie with whatever the Sioux are calling themselves these days and the Huskies. But the RedHawks would still be 3-4-1 against those two teams and would end up with a six seed. So much for the suspense. – In the bizarre stats area, Hutton is now tied with Melnick for best shooting percentage on the team, as both have scored nine times on 49 shots (.184). Maybe Brandt’s first career goal in Oxford last Saturday instilled confidence in him, as he had 27 shots on goal all season entering this weekend and fired six times in these two games, finding the net twice. – Tapping the old memory banks to recall a team that was more self-strangulation inducing, the 2000-01 Cincinnati Mighty Ducks come to mind. That team had to use 12 goalies during the regular season and lost player after player to Anaheim and Detroit, that team’s affiliates. They finished above .500 but took an early exit from the playoffs. 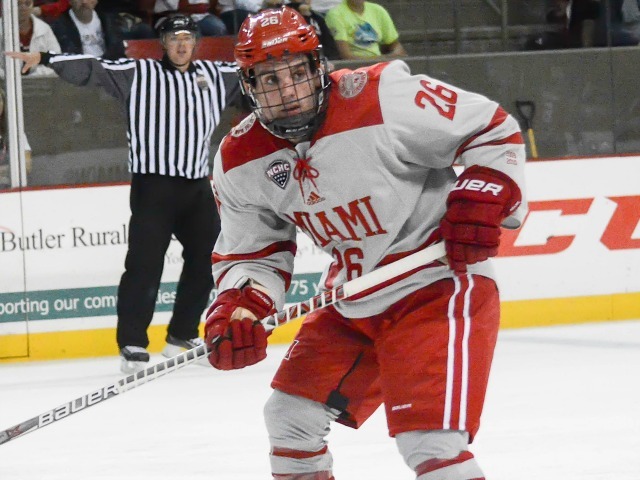 OXFORD, Ohio – Miami suffered through a miserable 3-12-1 stretch to wrap up the 2013-14 regular season and limped into its conference tournament, finishing last in the NCHC. That meant a best-of-3 series at top-seeded St. Cloud State just for the RedHawks to extend their season. Miami shocked the Huskies by winning Game 1, and just as it appeared Game 2 would head to overtime, Justin Greenberg buried the game-winning and series-clinching shot in the closing seconds of regulation. Justin Greenberg as a freshman (photo by Cathy Lachmann/BoB). The decisive play started with Matt Joyaux knocking down a SCSU shot in front of his net and skating to center, where he fed streaking Anthony Louis on the right wing. Louis crossed the blue line, curled and slid a pass to Greenberg, who was open in the slot. Greenberg settled the puck down and buried a wrister low to the glove side, then after sliding on his knees in celebration, he jumped into the arms of Alex Gacek – a close friend of his on the team – in one of the more picturesque moments in recent team history. It was just his second career goal, with his other coming in a 6-1 win over Colorado College 12 games earlier. That shift is even more impressive considering Greenberg did not field Division I offers until midway through his final season of juniors. Greenberg grew up in Plano, Texas, and he said his father, Joel, used to take him and his brother to watch his godfather’s son play. Both Greenberg brothers caught the fever and soon began lacing up the skates. Even with the Stars entrenched in the local market, Greenberg said he had a difficult time gauging his ability because of the relative lack of teams in the area. He was drafted by Green Bay of the USHL but ended up playing for the closer-to-home Texas Tornado of the NAHL. In Greenberg’s first season with that team, he recorded 27 points in 39 games, but more importantly, he netted the Robertson Cup-clinching goal in overtime. Greenberg rolled up 25 goals and 32 assists for 57 points in 60 games in his second season with Texas, toward the end of which he ended up committing to Miami. 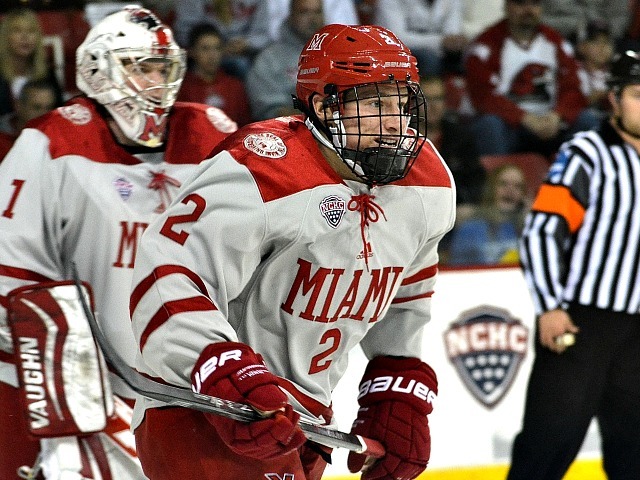 Greenberg’s brother was the same age as a former Miami forward from the Dallas area – Blake Coleman – and those two ended up playing against each other and becoming best friends. Greenberg did not commit until February of 2013, and was the last player in his class to sign. When he came to Oxford, Coleman was the only MU player he knew. “He definitely helped make the adjustment a lot more comfortable,” Greenberg said. In his freshman season, Greenberg dressed for 33 of the RedHawks’ 38 games, including the final 25. He finished with two goals – including that series clincher vs. St. Cloud State – and six assists while taking just four minor penalties. 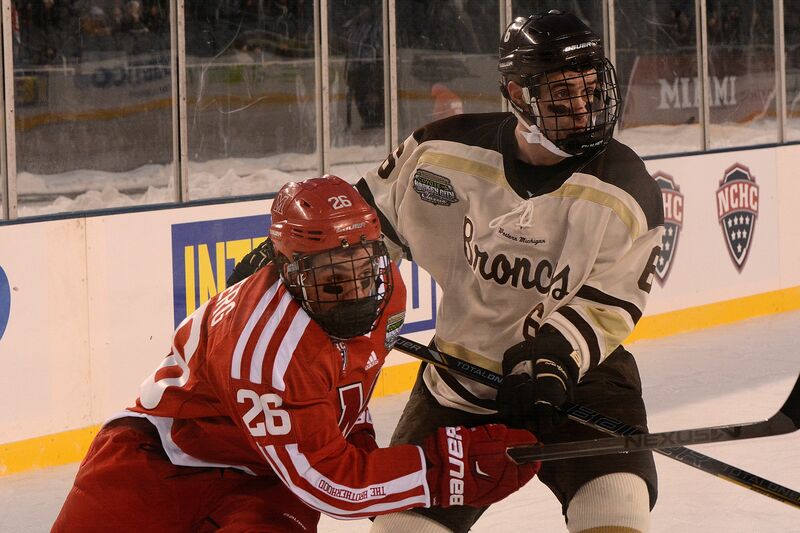 Justin Greenberg as a sophomore at the outdoor game at Soldier Field in Chicago (photo by Cathy Lachmann/BoB). Greenberg should have been brimming with confidence after playing such a crucial role in Miami’s postseason, but he was unable to work out that summer because of shoulder surgery. Partly as a result, on a points-per-game basis his sophomore season was his worst in Oxford, as he ended up with a goal and five helpers despite being in the lineup 35 times. 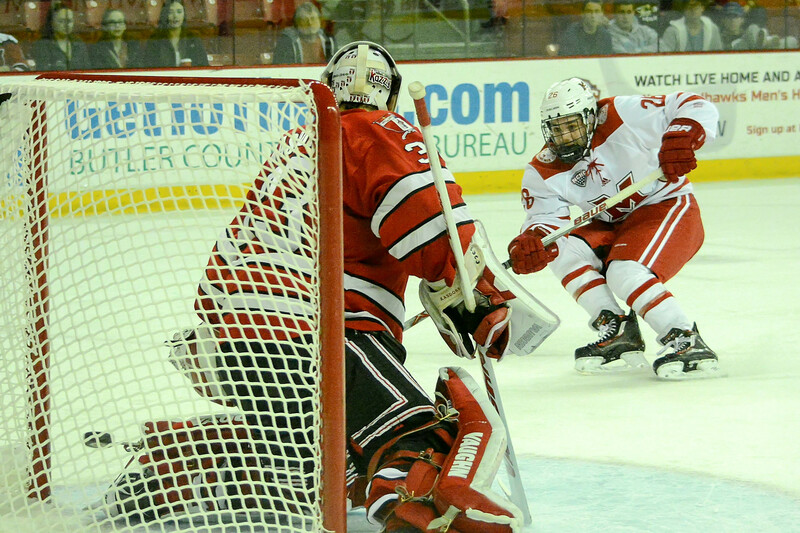 Justin Greenberg as a junior, scoring his lone goal that season vs. RPI (photo by Cathy Lachmann/BoB). 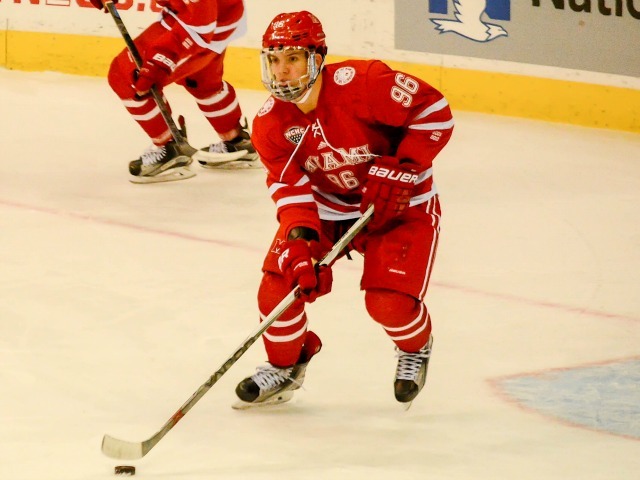 In his junior season, Greenberg saw more time on the penalty kill – partly due to the loss of key forwards including Austin Czarnik and Riley Barber – and he began to thrive in that role. He played 32 games and scored just once but tallied a career-best nine assists. 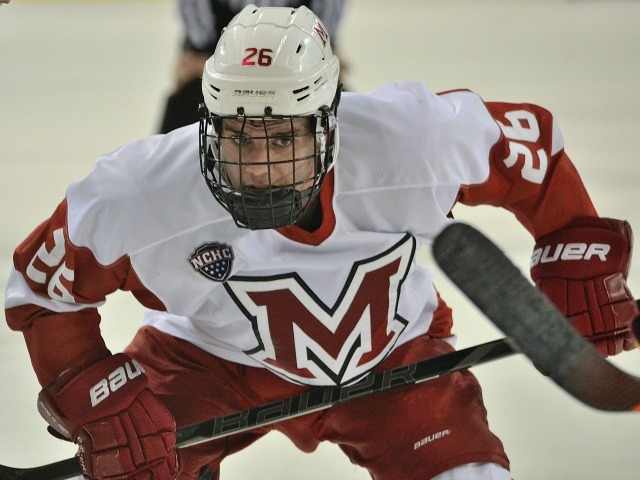 Greenberg blocked 22 shots – third-best among forwards on the team – and was assessed just one minor penalty as he helped the RedHawks to a 91.0 percent penalty killing percentage. Justin Greenberg as a senior (photo by Cathy Lachmann/BoB). This season, he has improved his win percentage in the faceoff circle to .499 after a slow start on draws. He worked with former assistant and ex-Miami star Derek Edwardson tirelessly, and that effort seems to paying off. He has a goal and three assists, but unfortunately has missed the last nine games with a lower body injury. Greenberg is close to returning and could be back this weekend, as he has just four regular season games remaining in a career that has seen him improve dramatically in some of the nuances of the game. Miami’s penalty killing was 85.0 percent with him in the lineup and 80.0 percent since his injury. 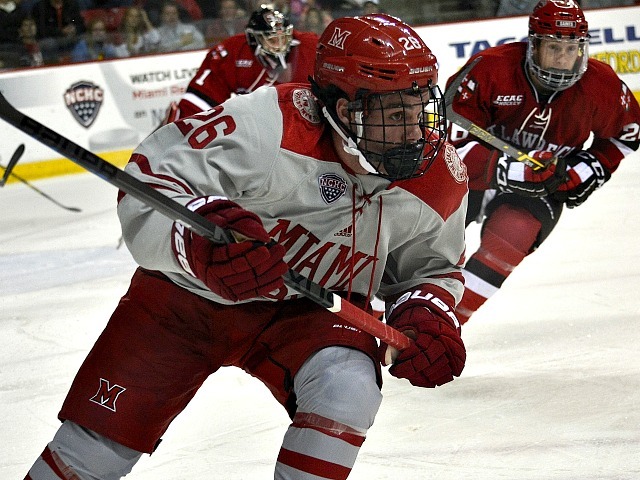 Greenberg is one of several Jewish players to come through the RedHawks’ hockey program in recent years. That list includes standouts Carter Camper and Matt and Nathan Davis. Joel Greenberg is Jewish and Justin’s mother, Doreen, is Christian, but Justin was allowed to decide whether to go through Bar Mitvah when he was a teenager and both he and his brother chose that route. “I felt like it was the right thing to do,” Greenberg said. For his career, Greenberg has logged 121 games, piling up five goals and 23 assists for 28 points. He has blocked 49 shots, and despite playing a defensive role much of the time, has just 30 penalty minutes. Wingels, Sullivan and Greenberg have been close friends the past several years. Greenberg said besides hockey, he said his personal growth is one of the best things to come out of his Miami experience. In the classroom, Greenberg has a 3.3 grade-point average as an accounting major. Because he signed so late, Greenberg did not have the opportunity to visit Oxford prior to his freshman year, but he fell in love with the town and the program immediately. OXFORD, Ohio – Miami’s Friday home games normally start at 7:35 p.m. This week’s series opener was moved up 30 minutes for national TV, but the team apparently didn’t get the memo, as the RedHawks were dominated in the first period of a 2-1 loss to Western Michigan at Cady Arena. The Broncos were better in every facet of the opening stanza, jumping out to a well-deserved early lead and almost a 2-0 edge, but a goal in the closing seconds of that frame was ultimately declared off-side. The final 40 minutes were pretty even, but the damage had been done. Both teams scored once in the final two periods, as that slow start and resulting first-period score ended up being the difference. The shots were 11-2 in favor of WMU midway through that first frame, which included one impotent Miami power play. A second man-advantage late in the period helped the RedHawks generate shots Nos. 3 and 4. How to view the remainder of the game depends on one’s perspective: Was it a valiant effort to battle back – taking control of parts of the third period – and hang with the No. 10 team in college hockey, or should Miami not have gotten itself into that first-period deficit to begin with? Unfortunately, after Miami’s three-win start, these final 10 games are too important to merely accept the former. The RedHawks had several paths to the NCAA Tournament – still do, by the way – but after a poor start this team can ill afford hard-fought losses like this one. – The game time of this one was 2:47, the longest for a 60-minute game in recent history. The main reason is the 14-minute delay at the end of the first period, as Miami coach Enrico Blasi challenged a Western Michigan goal that was ultimately deemed off-side. The officiating crew huddled in the penalty box area for several minutes, then possibly due to a monitor issue, shifted to another screen. We should want calls to be correct, and fans should understand the once-in-a-season glitch – if it was indeed that – that caused this huge delay. The question, which was initially raised by someone much smarter, was why they didn’t merely go to intermission and tack the additional 12 seconds onto the second period? If, for example, a pane of glass shatters with a minute left in a period this does happen on occasion in the NHL. Perhaps college hockey doesn’t allow that? We get that the NCHC isn’t going to have the number of HD angles the NHL does, but still, barring issues, five minutes should be the threshold for overturning a call. Or at least send players to the dressing room rather than have them come back on the ice to warm up again. – Miami has gone two straight games without an even strength or power play goal. It was shut out in its series finale in Omaha last Saturday, and its lone goal in this contest was shorthanded. – With this loss, the RedHawks are now three games under .500 and need a 7-2 finish if they hope to garner support for an NCAA at-large berth. A 6-3 record with success in the NCHCs could also vault Miami to the Tournament. MU’s strength of schedule is one of the best in college hockey but it still needs to climb into the top 13 or 14 in the PairWise and finish with a winning record. FORWARDS: D. Kiefer Sherwood get into that I’m-taking-over-the-game mode in the third period, and he battled for a loose puck to set up Miami’s lone goal. Other than Karch Bachman creating some late havoc there’s not much positive to be said about this group. Anthony Louis didn’t get back to cover players on multiple occasions. DEFENSEMEN: C. Belpedio struggled defensively but compensated with his goal. His physical presence is solid, but he is committing way too many turnovers for a captain and No. 1 blueliner. Chaz Switzer, playing for the first time in six weeks, seemed a lot more confident and made a lot of good decisions with the puck in his own zone. GOALTENDING: B. The first WMU goal was a wrister from the blue line that found its way through, and the second was on a poke from the side of the net. Maybe Larkin could’ve stopped one or both, but he shut down a number of good chances, including a breakaway and a scramble in front of the net during which he was knocked down and still made two shots on high-percentage shots. We say again: Any shortcomings in net have not been because of poor goaltending. LINEUP CHANGES: Justin Greenberg missed his fourth straight game, and he was seen in the concourse on crutches with a boot on his foot. He barely put pressure on his injured leg. Greenberg has been a solid penalty killer the past couple of seasons, and his absence has forced Miami to use top offensive forwards in that role. That either cuts down their ice time in scoring roles or risks them being overused. Colin Sullivan was listed as a forward, but he was really the seventh defenseman. That was so both Bryce Hatten and Chaz Switzer could be reinserted in the lineup, giving the team seven blueliners. Hatten was played sparingly, and Switzer definitely stepped up his game. It was a positive thing to see Miami come back from a first-period, two-goal deficit, but a downer that the RedHawks were unable to hold a late lead. So appropriately, Miami and Nebraska-Omaha skated to a 3-3 tie on Friday in the weekend series opener at UNO’s Baxter Arena. The Mavericks’ first goal was a bit lucky. RedHawks forward Ryan Siroky got in position to block a shot in the slot, and the puck appeared to deflect off his skate and into the net. It happens. But UNO scored again a minute later when Teemu Pulkkinen was left wide open in front of the net for a rebound. Same thing with the Mavericks’ tying goal. Jake Randolph was practically in his own time zone at the side of the net, and Austin Ortega – one of the most dangerous players in the league – fed him perfectly for the easy goal. This game marks the two-thirds mark of the regular season for Miami, and still too many opponents are not paying the price in front of the net. We saw this last week as well. On one UND goal, four Miami players chased the puck as a player crossed into the offensive zone, and that resulted in an easy tic-tac-toe goal when a pass got through all of the RedHawks defenders to wide-open North Dakota skaters. Miami has improved in a lot of areas as the season has progressed. This is a big one and at this point things aren’t getting better. And they need to. Quickly. Oh yeah, and the RedHawks took six straight penalties after going on the power play three times to open the game. Penalty No. 5 by Karch Bachman was the killer, as that’s when UNO tied it in the third period. Let’s look at the goals. 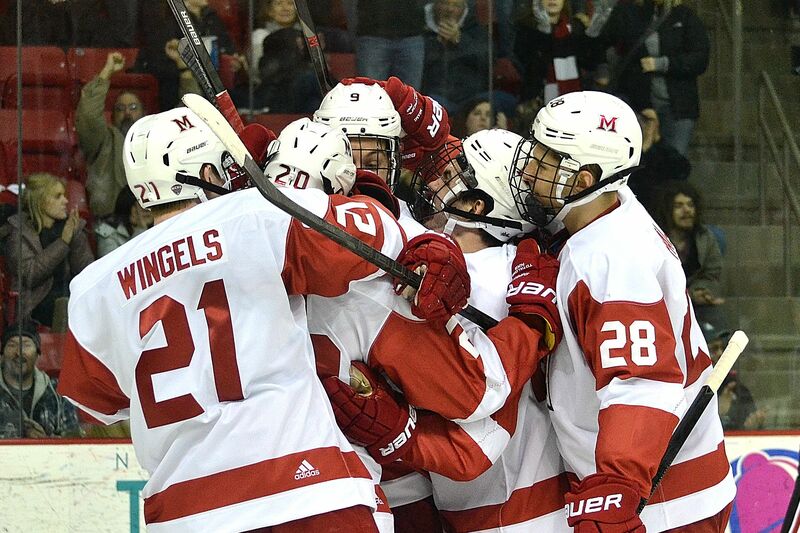 The first power play unit for Miami is just lethal, and that’s how the RedHawks scored their first goal. Anthony Louis got penetration and dropped a pass to Louie Belpedio for the rip. Miami forward Willie Knierim (photo by Cathy Lachmann/BoB). Then Willie Knierim scored. That’s three goals for the 18-year-old true freshman (he turns 19 on Sunday), with all coming in his last 10 games. Another 6-feet-3 forward, Sean Kuraly, who was a year older when he came to Oxford, scored three times in his first 36 games. We all know how he turned out. It’s also encouraging how Knierim is scoring goals. He’s not afraid to go into the slot, where he scored from on Friday on a wicked shot. His size is his biggest asset, and he can give opponents fits if he can establish position in front of the net, both by knocking home rebounds and screening goalies. Then there’s Carson Meyer, who looks like he’s watching the Miami figure skating team this season, as he managed to take a pass at the top of the crease and knock it home while doing part pirouette, part triple axle. That’s five goals in 10 games for him, and if wasn’t for goalie Ryan Larkin, Meyer would be skating away with the team’s rookie of the year award. Miami has shown that it can come back from deficits on the road in the most hostile of environments, having done so both in Grand Forks and Omaha the past two weekends. These road trips, while taxing, help build bonds between players, especially with younger teams. Yeah, the sixth tie of the year wasn’t the outcome Miami had hoped for, but considering the RedHawks were down 2-0 halfway through the first period, the ultimate result isn’t half bad. Or half good. – Let’s go back to the penalties. UNO took three, then Miami took six. It’s so hard to second-guess officiating from a computer monitor, so we’ll have to give the officials the benefit of the doubt. You can’t do that, especially on the road. That isn’t news to anyone, but the parade to the penalty box is something we’re seeing too often in recent weeks. The RedHawks have been shorthanded 23 times the past four games, or 5.8 times per game. By comparison, MU faced just 17 power plays in its previous five contests, an average of 3.4 opportunities. Carson Meyer was whistled twice in this game. – While Miami’s penchant for free hockey is approaching team record levels, its overtime appearance total is far from historic at the NCAA level. The RedHawks have tied six times, played in nine extra sessions and have three OT wins. The Division I records are 10 ties, 19 overtime games played in and seven wins after regulation. The 10 ties seems to most attainable, and that has been done three times: By Western Michigan in 2010-11 (Miami actually tied the Broncos once that season), Colorado College in 2008-09 and Minnesota State in 2002-03. However, if Miami does chase that record it’s a lot less likely the RedHawks will be in position to make the NCAA Tournament. 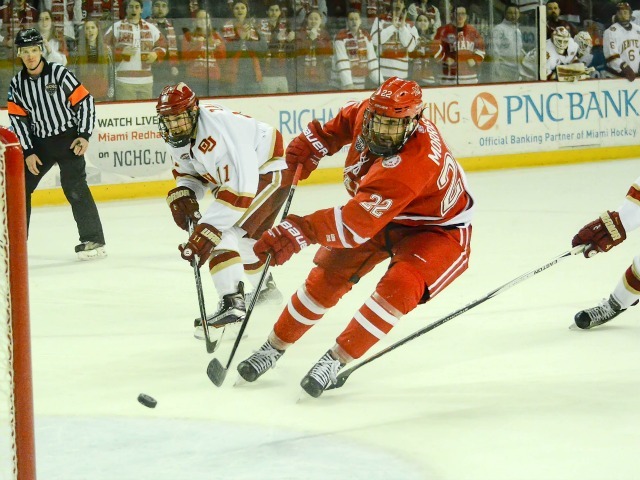 – The NCHC points race is crazy right now, as two points separate third place and seventh. Miami is currently in seventh, but a win Saturday would mean the RedHawks would be no worse than sixth heading home for the Western Michigan series, and they could go as high as third. After this weekend, Miami will have 10 games remaining and will play each of the top four teams in the league in terms of points, plus the sixth-best team (St. Cloud State). The RedHawks’ final five opponents are ranked Nos. 7, 14, 3, 2 and 9 in the PairWise. That means plenty of opportunity to move up, will they will have to earn it against some of the best teams in Division I. LINEUP CHANGES: Justin Greenberg has missed consecutive games. He had been in the lineup 53 straight contests prior. Alex Alger has dressed in his place in the last two games. For the sixth time in a row, the defensive six and goaltender were the same, as Coach Enrico Blasi seems to be set at those spots for the stretch run. Just when it seemed like Miami had pulled off a surprise by tying No. 1 Denver once on its home ice at elevation, the RedHawks did it again a night later. MU and the Pioneers skated to a 2-2 tie in a series that Miami entered as a huge underdog, having lost its previous five. Like Friday, the RedHawks were severely outshot, 51-26 including 22-3 in the first period (that’s a 37-6 first-period shot advantage for DU on the weekend). As we’re constantly reminded, especially with a young team, the season is a process, and hanging with the top team in NCAA for six period in a hostile rink a mile above sea level will do wonders for Miami’s confidence. And let’s face it, that confidence couldn’t have been in a great place after a pair of demoralizing losses at home to UNO last weekend. At the same time, confidence builder or not, the RedHawks (3-6-4) are still winless in league play with two of a possible 18 points a quarter of a way through their NCHC schedule. They have three wins in 13 games and haven’t picked up a victory in November, with their last coming on Oct. 28. Youth breeds inconsistency, something we’ve been reminded of often the first two months of this season, and while it can be incredibly frustrating, weekends like this show that at least Miami appears headed in the right direction overall. – You know what is consistent for Miami? Ryan Larkin. He posted a .963 save percentage this weekend, making 87 saves on 90 shots. The RedHawks have certainly had rough patches this season, but imagine if Larkin wasn’t between the pipes. – Willie Knierim hasn’t looked completely confident at times this season, but hopefully his rebound goal will springboard his overall game. After the puck hit goalie Tanner Jaillet, it popped into the air and Knierim banged it home before it hit the ice. It was a goal-scorer’s goal and from in close, and area the wide-body could have a lot of collegiate success as he adapts to this level. – With injuries and such plaguing a Miami team that was never terribly deep, Colin Sullivan played forward on Friday and shifted back to defense on Saturday. Coach Enrico Blasi loves guys he can play anywhere, and Sullivan can do just that, plus the fifth-year senior provides experience on a team lacking in that department. Defenseman Bryce Hatten sat out on Saturday after playing Friday, and forward Alex Alger returned to the lineup sheet. – The upcoming off weekend is bittersweet, as Miami would probably like to capitalize on the momentum it built this weekend, but at the same time it can certainly use another week to heal. Louie Belpedio should be ready and will fortify the blueline substantially, and Carson Meyer may be ready to go as well. Miami’s Justin Greenberg (photo by Cathy Lachmann/BoB). – Justin Greenberg has really stepped up not only on the PK but in the faceoff circle. He was 11-5 on draws Saturday and 20-10 for the weekend. OXFORD, Ohio – It’s funny how quickly things can change in hockey. Three weeks ago, Miami was a one-line team, and the star of that forward combination was even fading. Looking at the RedHawks’ past three games, including Friday’s 3-1 win over Denver at Cady Arena, it’s hard to rank their lines, as all are contributing in that all-important goal column. And when they aren’t, they’re at least creating scoring chances or playing responsibly on defense. Kevin Morris knocks home the clinching empty-net goal on Friday (photo by Cathy Lachmann). Forwards Kevin Morris and Anthony Louis have been major reasons for Miami’s rejuvenated offense. Yes, they accounted for three points on Friday, including two of the team’s three goals, but as usual with hockey, there’s much more beyond the surface. Morris’ pass to Roslovic for the eventual game-winner was as impressive as the goal itself, and his two-way play has made him one of the best forwards on the team in recent weeks. Louis played well on D vs. No. 13 Denver (12-8-5) and was a pest all of Friday as he continues his annual second-half surge for Miami (10-11-3). And yes, Roslovic was better as well, as he seemed more involved than he has been in the past few games, which is scary for opponents, especially with so many other forwards playing at a high level that opponents need to account for defensively. Also, the fourth line didn’t account for any goals on Friday, but that Crash Cousins-plus-Ryan-Siroky unit played well in its grinding role after Conor Lemirande recorded a hat trick last Saturday. Not to discount the defense corps, with the exception of a turnover-turned-goal, and the goaltending in this game in the least. But most that follow this team knew those areas weren’t going to be an issue this season. Need a stat to back up blueliner play: Senior Taylor Richart blocked eight shots on Friday. – Justin Greenberg made an incredibly selfless play on the PK in the first period, throwing his body at the puck near his defensive blue line to get the puck down the ice when Miami really needed a clear. Greenberg’s play hasn’t been mentioned above, but holy cow, talk about a candidate for most-improved player at this season’s awards banquet. – Another player not mentioned to this point: Alex Gacek. It’s mind blowing that someone his size is able to lay out players twice his size, which he did multiple times on Friday. Yet another senior that is playing some of his best hockey in his final stretch run. 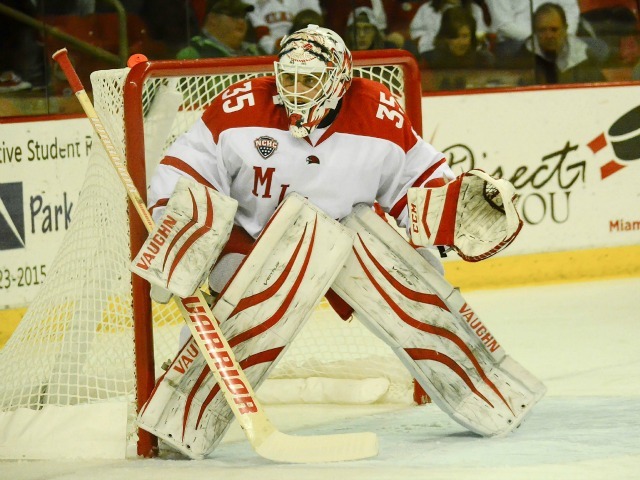 – It was Week 3 in GoalieGate for the RedHawks. Freshman Evan McCarthy was again the backup, as senior Ryan McKay was scratched. The reason for his suspension, or whatever we’re calling it, has been discussed ad nauseum, and BoB has no idea what the aftermath has been between McKay and the coaching staff, but here’s hoping it ends soon. McKay has been an exemplary player for 3½ years, and it’s tough to see this happen to a senior during his final stretch run. That said, even when McKay is reinstated, Jay Williams has been a wall in his absence, posting a .947 save percentage, so it may be tough for him to get into games with an .867 mark since the North Dakota series. – As far as who outplayed whom between Denver and Miami, the first period was pretty even. MU generated a scoring chance in the opening seconds, but there were few of those in the opening stanza and both teams buried theirs. The RedHawks dominated the second period, and Denver was very strong in the final stanza, although Miami played well also. Very well-played game, the type we’ll likely see more of in the second half of the NCHC season. – Well, the students were back for the first time since, well, before Thanksgiving, and it seemed to be an enthusiastic crowd. But the attendance for this game was still south of 3,000, which was disappointing, especially considering the magnitude and quality of this game. And unfortunately for some fans that meant the return to non-rock for the entire game and not just the first and third periods plus most of the second. Apparently there was no reason to stop at bringing back four-decades-old Village Idiots steamer YMCA and band favorite from the same Musak era Sweet Caroline – a pro-Boston fossil, which…hey wait…doesn’t Miami dislike Boston after all of those BC and BU losses in the NCAAs? Fortunately we also added in 1950s great “Shout” to its almost exclusively dance club repertoire, as opposed to the rock selections every other rink in North America touts. Hey, let’s not stop there: Let’s break out some Irving Berlin and then work ourselves back to Beethoven and eventually the Baroque era for some Bach and Vivaldi. Worth repeating: Having been to hockey games in over a dozen states and now six Canadian provinces, beautiful Cady Arena has easily the worst music selections of any rink I’ve ever attended. Not even close. – Sean Kuraly took two minors on the same shift at the end of the second period. The first one could’ve been debated. The second one for charging was un-captain-like. He has played so much better in recent weeks but he can’t let his emotions get the better of him. – Were Taylor Richart’s eight blocks mentioned above? They were, but let’s mention them again. FORWARDS: A-. Two goals plus the empty netter, but still a great effort against a hot team with two solid goalies. Lots of standouts in this one: Morris for one, but also Roslovic, Louis, Greenberg – liked Zach LaValle in this one too as he continues to gain confidence. DEFENSEMEN: B. Denver is a bit of a one-line team, and this corps was pretty good for the most part. Grant Hutton did turn the puck over for the Pioneers’ first goal, but he came back and played well after that. Amazing to see how much better Scott Dornbrock has gotten from Game 1 to Game 24. Richart had eight blocks. In case that wasn’t mentioned above. GOALTENDING: A. To say Williams stole this game might be an overstatement, but Miami certainly doesn’t win without his effort. He looked a little vulnerable early, which is not uncommon with Williams, but he was a rock the final 40 minutes. A great pass and backhand resulted in Denver’s lone goal, and Williams made two unbelievable saves in the third period to preserve the 2-1 lead. Williams has allowed just six goals in his four-game winning streak and has a goals-against average of 1.33 since taking over in net. LINEUP CHANGES: None. As mentioned previously, Coach Enrico Blasi typically likes to stick with a starting 18 by this point in the season, and it looks like this is the group. Hard to blame him, as it would be difficult to pick a weak link, but it’s always tough to see quality players sit in the stands, like Colin Sullivan and Devin Loe. The goaltending situation has been discussed at length, and it’s unclear if/when McKay will be re-instated. 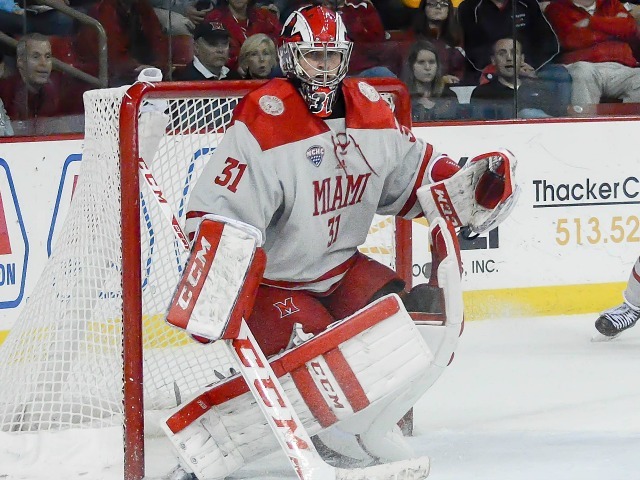 OXFORD, Ohio – A limited few have put the puck in the net regularly for Miami this season. But on Saturday. when the RedHawks broke the three-goal threshold for the first time in 2015-16, none of their markers came from their normal sources. 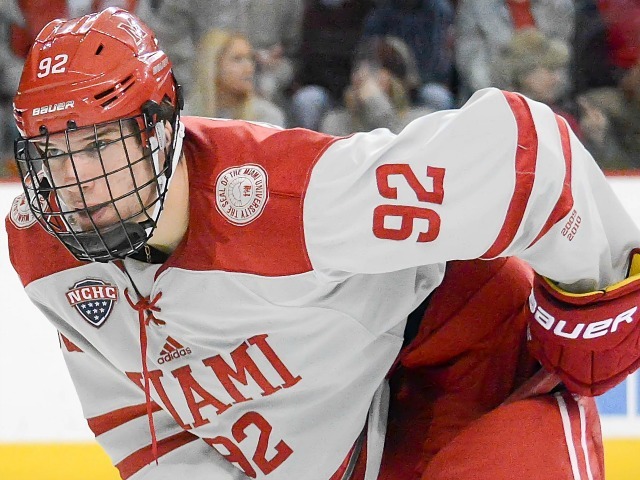 Miami beat RPI, 4-2 at Cady Arena on Sunday to salvage a series split, with scoring from Andrew Schmit, Justin Greenberg, Alex Gacek and Chris Joyaux. That foursome had combined for five prior goals this season and despite all four being seniors and regulars on the RedHawks’ lineup card the past four years – except for Schmit, who is a transfer – this group had a total of 22 career goals entering this game. Good for them, and better for the team. Anyone who has watched a game or followed the team this season knows Jack Roslovic can score, as he leads the team with nine tallies. Josh Melnick has no problem finding the net, nor does Anthony Louis, and Sean Kuraly certainly should score more than two goals the rest of this season. That’s five players who have a track record of netting goals regularly, and one is more of a projection. All season this team has struggled with scoring depth, and it got it when it needed it most. Winning was important, as Miami had gone 0-6-1 in its previous seven, and reaching the four-goal mark was important, even though it was on an empty-netter. If ever a team needed a spark, it was the RedHawks, who had not won in two months, and league play resumes for Miami next weekend. – Good offensive zone time in this game. Miami had several shifts in which it controlled the puck in its offensive zone for a minute-plus. The RedHawks absolutely dominated in the first few minutes and for the majority of the third period. – Jay Williams won his first game of the year in net. The senior may be the most enthusiastic player on the team, and that can only help the team this point. He didn’t dominate but at least deserves more playing time. – The officials were pretty inconsistent over the weekend and totally missed Roslovic getting hammered as he tried to return to the Miami bench in the third period. It was clear Roslovic was being run, and this would’ve been a great opportunity to assess one of those new interference major penalties. – The third line of Zach LaValle, Justin Greenberg and Kiefer Sherwood was the team’s best, especially in the third period when it generated tons of scoring chances, including Greenberg’s goal. – One negative: This power play is awful right now. Too many players stand still. Miami has not scored a PPG in six games, going 0-for-13 since. And oh yeah, RPI picked up shorthanded goals both nights, sending the RedHawks’ net goal differential on the power play to minus-2 in its last five. – Not a fan of the Saturday-Sunday thing. Most importantly, it gives less time for someone who writes about the team in his or her leisure to put up stories and photos. And the Sunday attendance was listed as barely 1,500. FORWARDS: A-. This was one of the best games this corps has played all season. Anthony Louis was outstanding all weekend, and Sean Kuraly had several good looks at the net. But it was Greenberg and Gacek coming up with the crucial third-period goals, both from the side of the net. As mentioned above, the Greenberg-Sherwood-LaValle line was this team’s best on this night, and all three figured in Greenberg’s clutch goal. DEFENSEMEN: A. RPI managed just 19 shots and two good scoring chances. Unfortunately for Miami, the Engineers buried both attempts. Scott Dornbrock had an above-average game, and Joyaux knocked home the clinching tally from three-quarters ice. A rare turnover by Matthew Caito led to RPI’s first goal, as he had a rare off game overall. GOALTENDING: B. Williams was only called on for 19 shots. He made a couple of solid saves, but the two top scoring chances he faced both went in the net. No one could say that he was outplayed by teammate Ryan McKay, so he may have earned another start next weekend. LINEUP CHANGES: Forwards Michael Mooney and Conor Lemirande were out from Saturday’s lineup and Devin Loe and Ryan Siroky were in. Defenseman Louie Belpedio remained out, as he is playing for Team USA in the World Juniors in Finland. Williams replaced McKay, who had started the previous nine games. After opening night, Miami’s last four games have been low scoring and close. A suggestion for fans: Get used to it. The RedHawks won its third straight game, 1-0 at St. Lawrence on Friday, thanks to 26 saves from goalie Ryan McKay and the fourth goal in five games for freshman forward Jack Roslovic. Miami is averaging 2.40 goals per game, tied for 33rd out of 59 teams in the NCAA. While the RedHawks will develop better chemistry, and its offense should evolve, a brutal NCHC schedule – starting next week – will counter much of that progress. Nothing against Miami at all. The freshmen forwards have been outstanding, and Sean Kuraly and Anthony Louis will hit their strides, hopefully sooner than later. But this team lost a ton of incredibly talented players up front, and its calling card this season will be its experienced defensemen and goaltenders. Despite giving up seven goals in its opener, Miami is tied for 22nd in college hockey with 2.40 goals against per game. The forwards are playing solid defense. The defenseman, at least the last few games, are playing very well in their own end. McKay is in the zone and has the ability to steal games on his own. This is a good team right now, and it could be a great team. RedHawks fans should be excited for the upcoming conference schedule. But this team isn’t going to put up a lot of six-, seven- and eight-goal games. Not to worry: 3-1 wins count just as much as 5-3 victories. – Holy cow was Friday a tightly-called game. The St. Lawrence PxP guy was complaining about calls against both teams. Seven power plays for both teams in a not-more-physical-than-usual game is a ton. Miami made the most of it: The RedHawks went 1-for-7 and SLU went 0-for-7, and the final was 1-0. – Hard to tell from a computer screen, but the ice looked awful from 700 miles away. It looked like the puck was hopping all over the place. It bounced over sticks and it wouldn’t stay flat, squelching scoring chances for both teams. That would explain one total goal in the game. – Miami did a great job of shutting down shooting lanes on the penalty kill. NCHC teams do this to the RedHawks all the time. There were a lot of reasons MU was perfect on the PK, and that was a big one. Penalty killing forwards Josh Melnick, Alex Gacek and Kevin Morris have been absolutely pests, and Justin Greenberg was put in that role as well in his first game of the season last night, so hopefully he can replicate the others’ success. – Roslovic has been a stud since Game 1, but it’s really amazing how much better he’s gotten in just a couple of weeks. He looks more comfortable now and does so much more than just score goals. He was clearly the best skater for either team last night, and not just because he notched the lone marker. Miami defenseman Taylor Richart (photo by Cathy Lachmann). – This game was called so tightly that defenseman Taylor Richart was actually whistled for a minor. The stay-at-home defense role is often overlooked in hockey, so some context on the senior: That is just his fifth minor since the beginning of his sophomore year, spanning 64 games. For someone who is in the trenches every night, that’s nearly unheard of. – McKay has won three straight games for the first time since Miami’s NCHC Tournament run in 2013-14. It was his first shutout since the Frozen Faceoff semifinal vs. North Dakota on March 21, 2014. His save percentage is now .954. He deserves a lot of credit for stopping 14 shots in the third period, including some excellent scoring chances after seeing just two shots in the second frame. – In the strange stats department: How about consistency in Miami’s shots allowed? In their five games, the RedHawks have allowed 26, 26, 27, 28 and 26 SOG. LINEUP CHANGES: Greenberg, who was banged up the first two weeks, played in his first game of the season on Friday. Scratched up front were sophomore Conor Lemirande for the first time this season and senior Michael Mooney for the second time. The odd man out on defense was junior Colin Sullivan, who has now not dressed twice this campaign. It was the fourth straight start for McKay in net.